I’m super busy at the moment because I’m having my final master’s exam next week. I can’t believe I’ll finally be done with university. Yaaaay! So I was looking for some really simple recipes to make this week. And this vegan tomato basil soup was just perfect. It’s super easy to make, incredibly creamy, and so comforting! It gets its creamy texture from cashews and nutritional yeast. The perfect meal for lazy or busy days! I had an absolute crush on this soup some years ago, but then I somehow forgot about it or moved on to something else. Maybe it’s just me, but this happens quiet often. I can’t get enough of some recipes and after a while I find another recipe that I absolutely love and kinda forget about the previous one. Haha! This sounds probably pretty weird. But anyways, so this week I was really craving vegan tomato soup, so I looked through some of my old recipes (a chaotic collection scribbled on small pieces of paper, napkins, and grocery bills) and I actually managed to find my tomato soup recipe. It seriously couldn’t be easier and you only need like 10 minutes to make it. I used canned tomatoes for this one, but of course you can also use fresh tomatoes, especially in the summer. But I wanted it to be super quick this time. 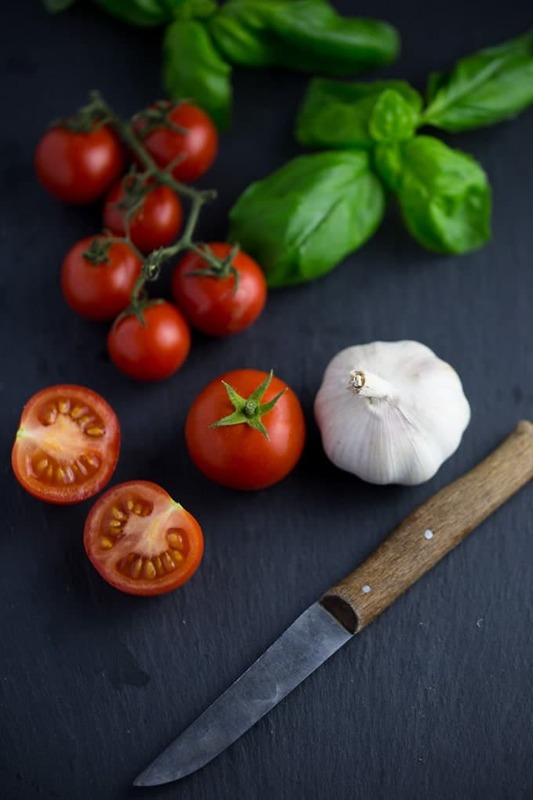 Besides the tomatoes, you need three cloves of garlic, one onion, basil, nutritional yeast, and cashews. 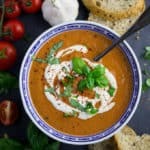 The nutritional yeast and the cashews make this vegan tomato basil soup super creamy and give it a light cheesy taste. I’ve served it with vegan grilled cheese sandwiches and topped it off with vegan cashews cream. Soy cream also works just fine. So yummy! This seriously is vegan comfort food at its best!! It’s also great with croutons on top or rice. I hope you like this vegan tomato soup as much as I do. Have a great week, everyone! 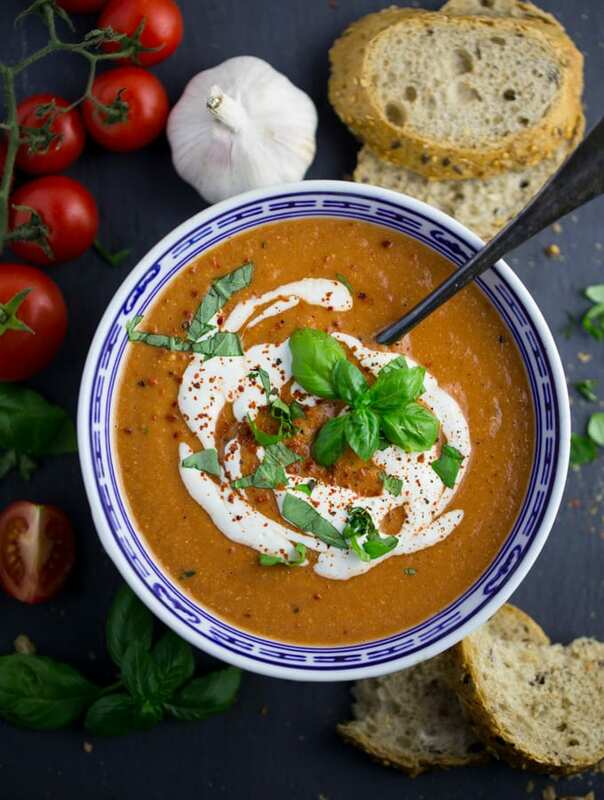 This vegan tomato basil soup with cashews is super easy to make, incredibly creamy, and so comforting! It's the perfect meal for lazy or busy days! Heat the olive oil and sauté the onion and the garlic for about 2-3 minutes. Then add the tomatoes and the basil. Cook for a minute. Transfer to a blender, add the cashews and the nutritional yeast, and blend until smooth. Season the soup with salt, pepper, and red pepper flakes and cook for about 3 minutes. Top it with cashew or soy cream, more chopped basil, and red pepper flakes. Serve with fresh bread or vegan cheese sandwiches. You had me at super lazy. This looks like it’s also super delicious! 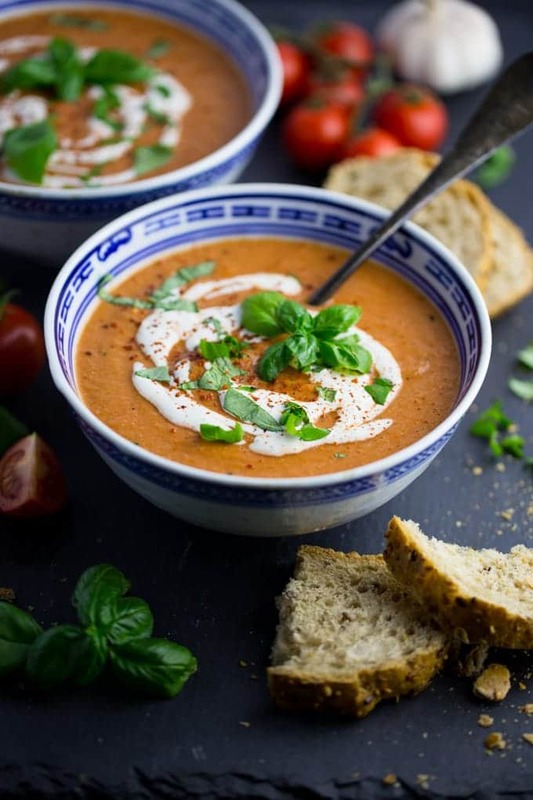 There’s really nothing as comforting as a good tomato soup. I love that you’ve added cashew cream to yours. 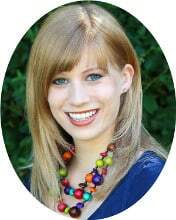 Congrats on almost being done with your studies! This is one of my favorite soups. A big bowl of this and a vegan grilled cheese sandwich would make me so happy! 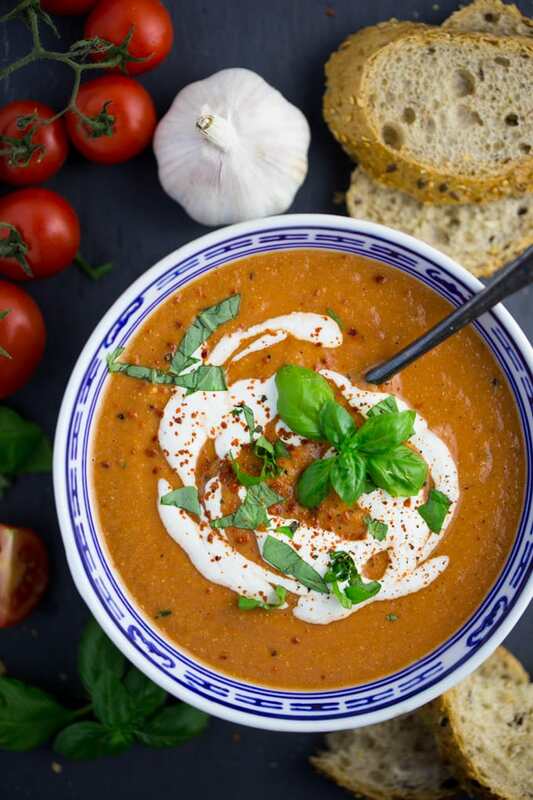 Tomato soup is always a good choice! Looks so good! And congrats on finishing up with school!! I love every ingredient in this stunning soup. I lived on tomato soup as a kid, but had forgotten about it. Time to make a bowl of this. 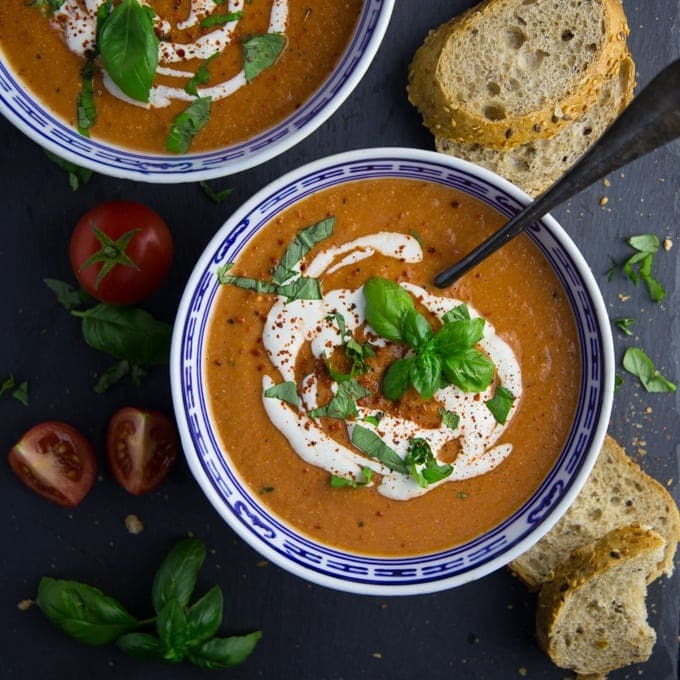 Tomato soup is hands down one of my favorite comfort foods! We make it all the time. Pair it with a qeusa or grilled cheese and I’m a happy camper!! YUM! I love tomato soup especially with basil. I could literally eat it everyday. I love the addition of cashews to make it creamy. One of my favorite soups ever! Looks so good! And so funny you said it’s perfect for lazy days because I have a rich tomato soup on my blog that I named “Lazy Day” tomato soup, lol! I make mine really similar to yours. 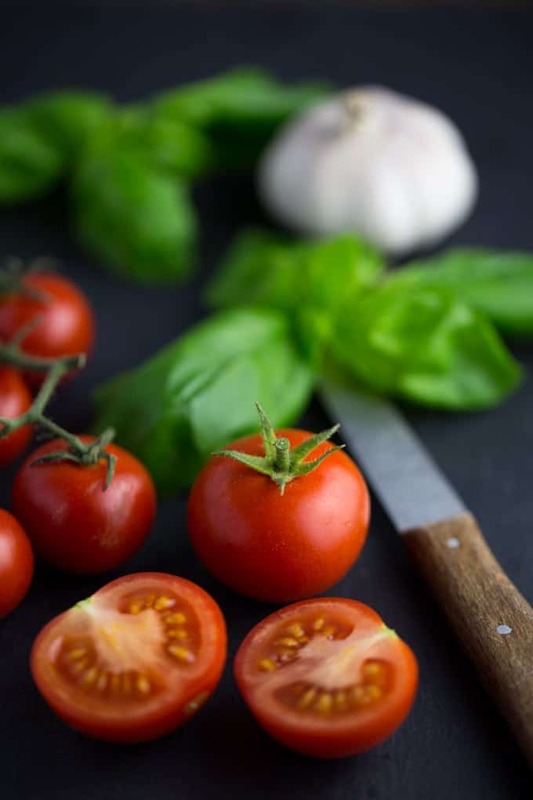 Love the added basil, yum! Tomato soup is so good and yours look divine. I wish I had a bowl of it in front of me right now. I love that you added the cashew cream, I’m really into cashews at the moment. This recipe looks delicious, I’m going to make it really soon. This looks absolutely delicious. Tomato soup is always my favorite soup. I’m going to make this on the weekend. I love winding down with a bowl of soup and a good movie. I tried it out last night and it was so delicious! Do you think the recipe would also work as a gazpacho? Thank you!